Crispy Kachori recipe by SumeraNawed at DesiRecipes.com. Rava (Semolina ) 100 gms. Split Green Gram (moong daal) 225 gms. Chili powder 1 ½ tsp. Wash the split green gram and soak overnight. Scrape the skin off the ginger and grate. Chop the green chilies and set aside. Grate the coconut and set aside. Sieve the refined flour and set aside. Heat the ghee in a frying pan and add the split green gram and saute over medium to low heat until cooked. Add the grated coconut, coriander leaves , green chillies, turmeric , chili powder and salt to taste. Now mix in the heeng, ginger and cummin-coriander powder. Stir and add the lime juice and sugar and cook for a few minutes longer making sure that he mixture is moist but not liquidy. Adjust seasoning to taste, remove from the flame and add the raisins . Set aside and start preparing the covering. Add salt to the sieved flour and rub in the ghee , add the rava and enough water to make stiff dough. Keep the dough covered with a damp cloth for 45 minutes. Knead well and divide the dough into equal portions. in the centre. Bring all the edges of the puri together and seal using little water. 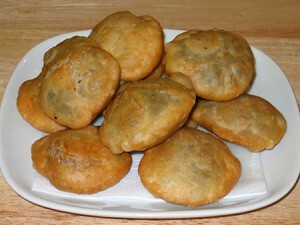 Heat the oil until quite hot in a frying pan and deep-fry the kachoris on medium heat until golden brown. Serve hot with imli or hara dhanya chutney. Rawa is actualy Rava. It is Semolina (Suji).